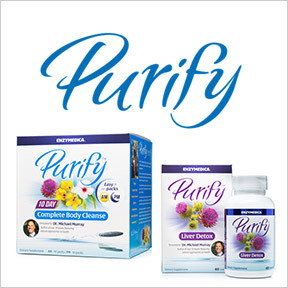 Professional Supplement Center now carries Purify, a line of comprehensive formulas from Enzymedica, a Florida-based digestive health and wellness supplement company. Specifically designed as a whole-body approach to natural cleansing and detoxification, Purify™ was formulated by Dr. Michael Murray, who has dedicated thirty-five years to providing natural scientifically-based, effective products for health maintenance and disease treatment. Dr. Murray believes that detoxification has become a necessity of modern life due to the scope of harmful industrial chemicals, heavy metals, pesticides and herbicides in our environment. These toxins can accumulate in our bodies, and have detrimental effects on liver health, as well as cellular function and structure. Purify products are manufactured under strict guidelines in a GMP facility utilizing the only the highest quality ingredients. To ensure purity, Purify™ natural cleansing products contain no fillers or genetically modified ingredients. Purify 10 Day Complete Body Cleanse: 25% OFF This AM/PM comprehensive program is designed to accomplish specific tasks in the detoxification and elimination of waste, toxins and other foreign material. The program provides six different formulas to support a complete body cleanse, including probiotic, enzyme, organic veggie, mixed mineral ascorbates, and liver detox blends. Gluten, dairy, soy and artificial ingredient free, Non-GMO vegetarian formulations. Purify Liver Detox: 25% OFF This product provides therapeutic levels of premium nutrients known to offer comprehensive support for liver detoxification and function. Highly bioavailable ingredients assist in providing liver protection, as well as reduced oxidative stress. Gluten, soy, dairy and artificial ingredient free, Non-GMO vegan formulation. Purify Daily Regularity: 25% OFF This advanced formula provides natural plant extracts that work synergistically to provide gentle and effective support for occasional constipation, as well as support for colon health and daily regularity. Gluten, soy, dairy and artificial ingredient free, Non-GMO vegan formulation. Purify Fiber Drink +: 25% OFF This gentle formula provides four tasteless and odorless dietary fibers including tapioca, coconut powder, cacao powder and hydrolyzed guar gum to assist natural digestion, regularity and detoxification processes. Pomegranate, beet, watermelon and cucumber extracts provide unique phytonutrients that assist in cleansing. Perfectly balanced for everyday use. Non-GMO formulation. Purify Activated Coconut Charcoal +: 25% OFF Activated Coconut Charcoal supports natural detoxification through absorption by capturing and trapping toxins and other elements for elimination. Ingredients such as ginger and alpha galactosidase provide soothing benefits and assist with occasional gas and bloating. Gluten, soy, dairy and artificial ingredient free, Non-GMO vegan formulation. This entry was posted in Home and tagged Professional Supplement Center, Purify - Featured Product, Purify 10 Day Complete Body Cleanse, Purify Activated Coconut Charcoal +, Purify Daily Regularity, Purify Fiber Drink +, Purify Liver Detox, Vitamins and supplements, www.professionalsupplementcenter.com. Bookmark the permalink.